You're cruising the grocery store aisles, minding your own business when all of a sudden... woosh, thud. A stray puddle of water in the produce section causes you to slip and fall, severely injuring your back. A nice Sunday drive with the family turns horribly wrong when your mini-van is rear-ended by a tractor trailer barreling through a red light. Now your spouse is in physical therapy for neck trauma, your son has a broken arm, and doctors are still trying to pinpoint your exact injuries. Nobody wants to be put in one of these situations; however, they can happen to anyone and they happen every single day. The damage has been done and now you want/need to be compensated for your injuries. In most personal injury cases, people file and insurance claim before they can collect any damages. It can be a confusing and intimidating process, but we're here to simplify things for you. Immediately following an accident be sure to exchange information with all parties involved. Names, license plate number, insurance information, and pictures from the scene will prove helpful in your case. Then notify your insurance company of the accident. They will more than likely ask you to provide them with a written statement about exactly what happened. This starts the claim process and they will assign a representative to your case. This person is called and adjuster. There will be an adjuster from your insurance and an adjuster from the at-fault driver's insurance who are involved. The adjusters will investigate the crash to determine who was it fault and what obligations, if any, each insurance company has to any persons who have been injured or suffered some type of loss. The adjusters will want to talk to you, any witnesses, law enforcement (if applicable) and review any reports associated with the incident. This is where things can get frustrating because depending on how complicated the case is, the investigation can be completed rather quickly or can get dragged on for months. Point of advice: don't talk to the other driver's insurance adjuster without first consulting with an attorney. Once the adjuster's investigation is complete, he may or may not offer you a settlement. Here's a very important thing to remember: you DO NOT need to accept this settlement! And you probably shouldn't because without an attorney, chances are they are offering you a fraction of what your case is really worth. This is when having a good lawyer is of extreme value because an attorney knows how to negotiate effectively with insurance companies. You can go back and forth a few times with the insurance company or if you choose to reject the offer and take them to court. Insurance companies have plenty of highly skilled lawyers on their side when it comes to these types of things. So why shouldn't you too? 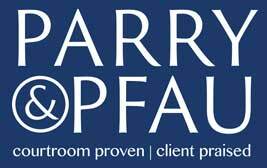 At Parry & Pfau, we will do the negotiating (and if necessary, fighting) for you so you can focus on your life. If you've been injured in a car crash, slip and fall, or any other accident give us a call and we'd be happy to help you. Many people who have suffered a personal injury in Nevada have difficulty understanding the legal terms used in their subsequent lawsuit. While virtually everyone has heard of a personal injury case, many individuals who are involved in one have never dealt with this type of lawsuit before. Unfortunately, these young students often overindulge during Spring Break, particularly when the events go unsupervised. Las Vegas accident victims typically have to fight for the monetary compensation to which they are entitled. How Long Should I Wait to File a Personal Injury Claim in Nevada? In order to protect your rights under applicable law, it is critical that a lawsuit is filed in Nevada’s court system in a timely manner and that it complies with the state’s statute of limitations. the sidewalks on the Las Vegas strip are covered by mobs of people trying to find their way to their destinations as well as take in the lights and sounds of the city. The state of Nevada ranked in the top 10 in the nation for bad drivers. While physical injuries sustained in a Nevada car accident are often immediately obvious, in many cases the victims suffer more damage than meets the eye. While the facts of each Las Vegas car accident can be as unique as the parties involved, there are some types of accidents that are more common than others. Understanding the difference between a commercial truck and a standard vehicle is essential in staying safe on Nevada’s highways. Newer PostCan I Appeal My Personal Injury Judgment?